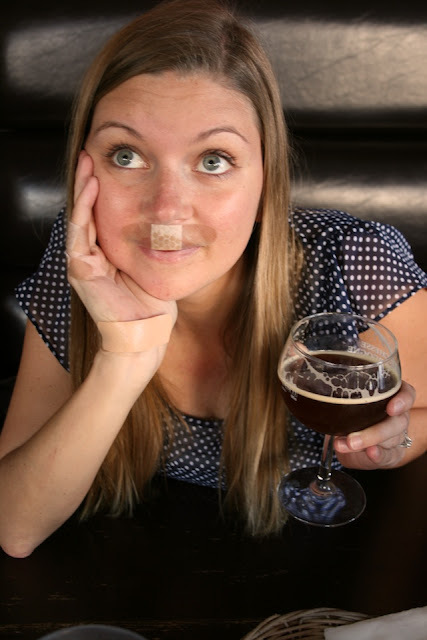 brooke: Putting life into perspective// A story about a band-aid mustache and so much more. Putting life into perspective// A story about a band-aid mustache and so much more. Wednesday was not my best day. I literally planted my face into the asphalt on a run, not to mention my shoulder, knee, and hand. But my face! That was the saddest part. Matt had taken the day off of work to hang out with me, and we both started our days with some exercise- him, a swim, and me, a run with the dog. Until said dog decided to bolt after a cat as we were about five houses away from finishing our run. The next thing I remember is my face on the asphalt. Luckily, Matt was my nurse, and he bandaged me up. We still spent the day outside enjoying the sunshine, Matt looking handsome and me looking quite fabulous with a band-aid mustache, because my lip wouldn't stop bleeding without it. The looks I got from passersby were interesting, some immediately regretful they had looked my way, turning their heads away as quickly as they could, and others, just offering me a sympathetic smile with that look in their eyes that silently conveyed they felt sorry for me, the girl with a band-aid mustache. Over dinner, Matt and I discussed two of his students, one who graduated last year, and is now in a vegetative state from a brain tumor, just waiting out his days. And another who has been diagnosed with cancer and is awaiting results to see if the doctors were able to get it all. After dinner, as we walked through an eclectic beach town, Matt gave this student a call to check up on him and had a conversation with his mom. He let her know that he was praying for her son, and she told him they were just waiting to find out and that maybe the next step would be chemo. As our night continued on, we couldn't help but hold hands a little tighter, fully aware that life is fleeting and oh so precious, and suddenly a band-aid mustache was the least of our worries. Brooke! I am so glad you didn't bust one of your teeth! That could have been terrible. I like that what started off as an unfortunate incident for you, ended up making you realize how precious your loved ones are, and how grateful you are for your own life. It's the little things in life that make us realize this sometimes.